Skinny Taco Soup made in the slow cooker is packed with flavor and super simple to prepare. Sauté onions and turkey, open a few cans, and you’re good to go! The mornings are crisp and the leaves are changing colors and drifting off our trees and that’s a sure sign that it’s soup time! 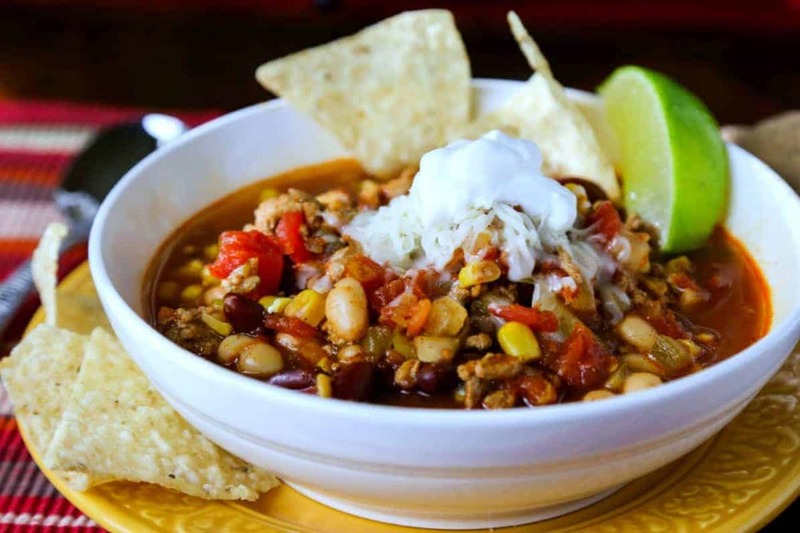 There are so many taco soup recipes out there, but this Skinny Slow Cooker Taco Soup made with lean ground turkey is sure to become one of your new favorites. This is one of those good pantry recipes. Other than sautéing the fresh ground turkey and onion, all you have to do is open up a few cans. How much easier could it get?! And as a bonus, this soup skips using the packaged taco seasoning mix which means there’s less sodium and who knows what else. An easy, healthier, yet still delicious soup? I’m all in! 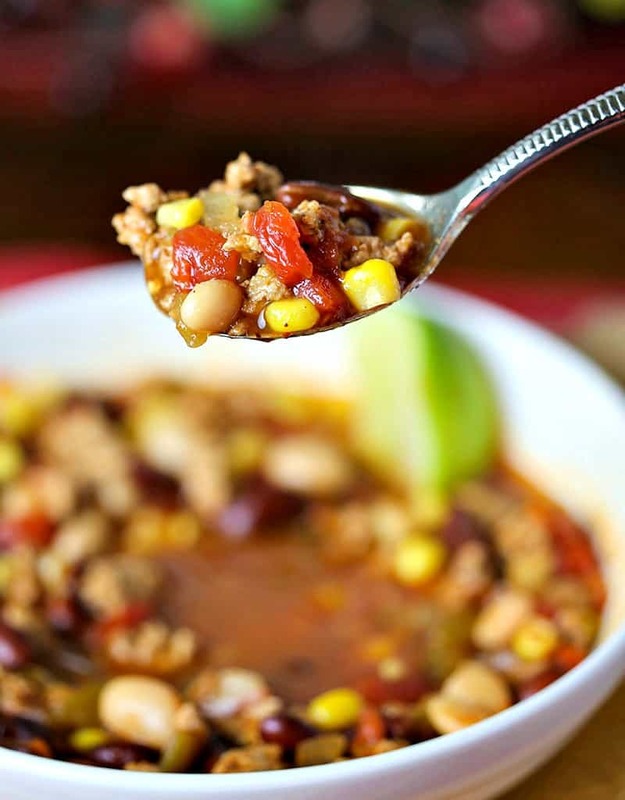 When I cook soups with ground turkey, I like to give it an extra flavor and color boost by adding the spices before I add the turkey to the rest of the soup ingredients. 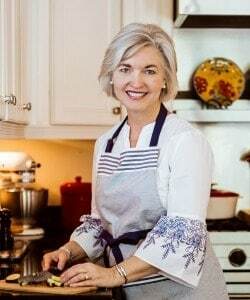 First, I cook the turkey and diced onions in a large skillet until done, breaking it up with a fork to make sure there are no large clumps of meat. Then I sprinkle the meat mixture with my spices and then cook and stir for another three to four minutes. The chili powder, paprika, and black pepper especially work to give the meat a nice, rich color so you can fake out the family—they’ll never guess that it’s turkey instead of beef! 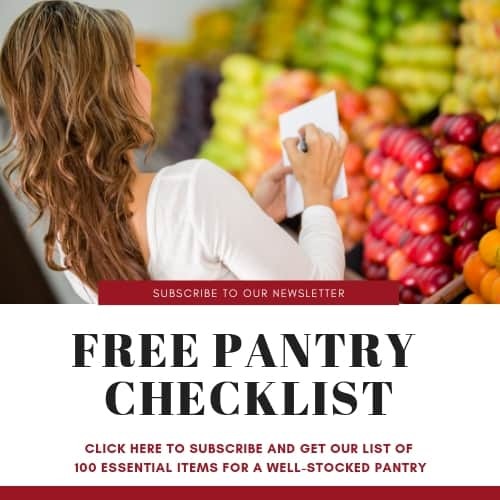 Easy Brunswick Stew with pulled pork or chicken has everything you need to serve up a hearty, filling meal to feed a group of hungry folks. Creamy Chicken Florentine Soup—make this rich, creamy soup in the slow cooker with chicken, fresh spinach, and mushrooms. Top with Parmesan croutons for extra flavor. Rustic Sausage Tortellini Soup—with either spicy or mild Italian sausage—is a warm and filling vegetable soup for a chilly day. 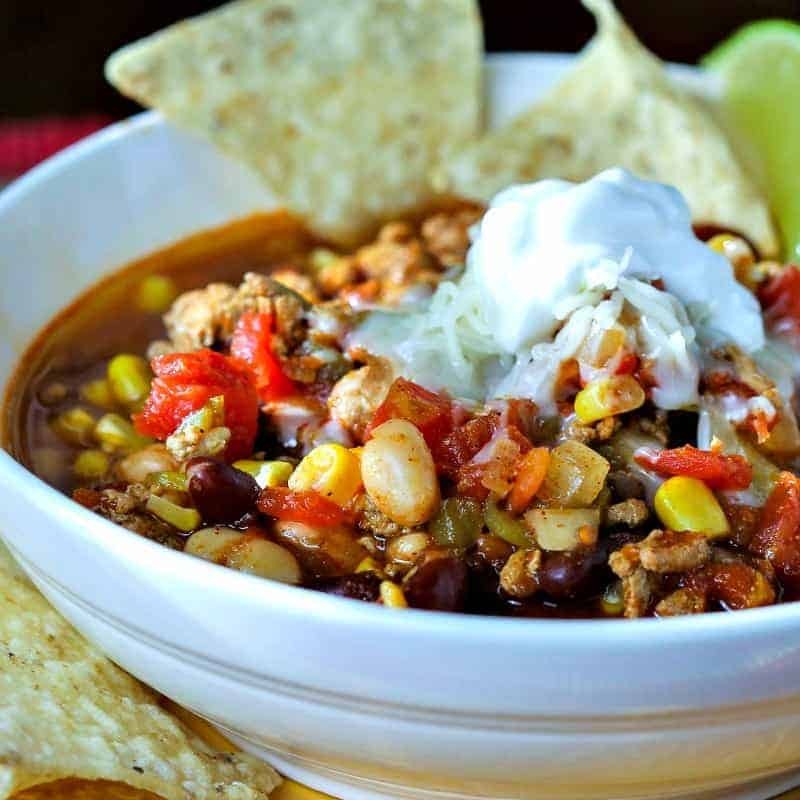 Skinny Taco Soup made in the slow cooker is packed with flavor and super simple to prepare. Sauté onions and turkey, open a few cans, and you're good to go! Heat olive oil in a large non-stick skilled over medium heat. Add ground turkey and the diced onion and cook (stirring frequently to break up any chunks) until the meat is done and the onions are translucent. Drain the turkey and onions and return to the skillet. Sprinkle the spices (chili powder, garlic powder, black pepper, cumin, salt, paprika, and onion powder) over all and continue to cook and stir until the spices coat the meat, turning it a nice brown, about 3-4 minutes. Add the meat mixture to the bottom of a slow cooker, then add the remaining ingredients and stir. Cook on high heat for 4 to 5 hours. Serve with shredded cheese, sour cream, lime slices, and tortilla chips, if desired.